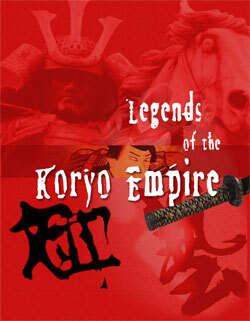 Legends of the Koryo Empire is the third in our line of small legends books. These books aim to complement the GM running any Legends game by providing an overview of a region's history. This book provides the GM of a Legends of the Samurai campaign with information on the nearby Koryo Empire, modern day Korea. The Koryo Empire was often caught between Japan and its mainland neighbors, serving as a staging area for invasions of Japan by the Mongols. The Shogun referred to Korea as "an arrow pointed at the heart of Japan." The Koryo Empire would make for an exciting locale for Japanese adventurers or an exotic birthplace for a character adventuring in Japan itself. If the campaign takes place during the late 16th century the PCs could even be part of the invasion force attempting to add Koryo to the domain of Shogun Hideyoshi.